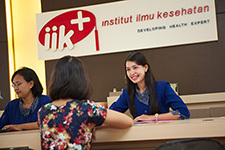 If the prospective student is already in Indonesia and wants to register to IIK Kediri, the student can arrange the residency and student visa at the immigration office. Students must already have a visitor visa (60 days) from their country. If the prospective student is still in the country of origin and wants to register to IIK, IIK can arrange the student visa. Once the student visa is ready, the prospective student can have the residency visa from his/her country.